Was Comic Book Hero Superman Influenced by the Ancient Egyptian Sun God Horus? Ancient Egypt has made numerous contributions to human civilization, including the pyramids, the mummification process, the production of papyri, as well as art and architecture. Few, however, would ever guess that one of the modern world’s most recognizable heroes may owe his existence to the ancient Egyptians. It has been claimed that DC Comic’s Superman was actually influenced by the Egyptian falcon-headed god, Horus, or as the supporters of this claim call him, Heru. Proponents of this theory point to the numerous similarities between the two characters and their lives. For instance, it is claimed that both Heru/Horus and Superman are associated with the Sun. While the former is said to be a solar deity, the latter obtains his power from the Sun. In addition, Horus/Heru lost his father, as did Superman. Furthermore, it has been indicated that both figures came to earth from an advanced civilization to escape from destruction. The theme of resurrection is said to be present in both stories, as Horus/Heru is claimed to have ‘resurrected twice as Asar (Osiris) and as an infant’, while Superman also died and was resurrected in his long-running storyline. Some of these similarities, however, are tentative at best. The importance of the Sun in the lives of both characters, for instance, is an overly general claim. After all, solar deities exist in many cultures throughout the world. Why should Superman be connected with Horus and not with the Ādityas (a class of solar deities in Hinduism), or one of the Proto-European Sun deities, or another Egyptian Sun god, Aten? Moreover, the connection between Horus/Heru losing his father and Superman losing both his biological parents contributes little to linking the two characters. The circumstances of the deaths of the two pairs of parents are quite dissimilar. Whilst Osiris, the father of Horus/Heru, was murdered by his brother Set, Superman’s parents, Jor-El and Lara, died when their home planet, Krypton, was destroyed. Horus/Heru was tasked with avenging his father’s death, while this theme of avenging one’s parents does not appear in Superman. Other claims of similarities are more seriously flawed. For example, the claim that both Horus/Heru and Superman fled to earth from an advanced civilization to avoid destruction may also be disputed. In Egyptian mythology, Isis, the mother of Horus, fled from Upper Egypt to Lower Egypt when she was pregnant to avoid her evil brother Set. These events are believed to have taken place in Egypt itself, and there is nothing to say that Upper Egypt was more advanced than Lower Egypt. The claim that Horus resurrected twice is more problematic, as that does not happen in Egyptian mythology. It was Osiris, rather than Horus/Heru who was said to have been resurrected momentarily through the magic of his wife Isis. The purpose for bringing Osiris back from the dead was to allow Isis to conceive a son who would avenge the death his father. When making comparisons between deities, mythical legends, and modern superheroes, narrative specifics will never fully align, and direct influences cannot be proven without a doubt. However, connections can be made between them which may demonstrate that modern mythical heroes (derived from the Greek term hērōs) are a continuation of mythology creation that goes back to the dawn of human imagination. Mythological heroes around the world were portrayed as truly “super”, meaning existing above and beyond humanity. They were more beautiful, more courageous, and more resourceful than mortals. If they weren’t gods, they were often were gifted with powers of the gods, reaching beyond human ability, and were portrayed in ancient artwork as the height of physical perfection. These archetypes certainly continue to be expressed in our modern heroes, in characters like Superman, Batman, and others. Like Superman, ancient heroes used their powers to defeat evil (in a general sense). The traditional themes found within ancient myths persist today in modern super hero narratives. 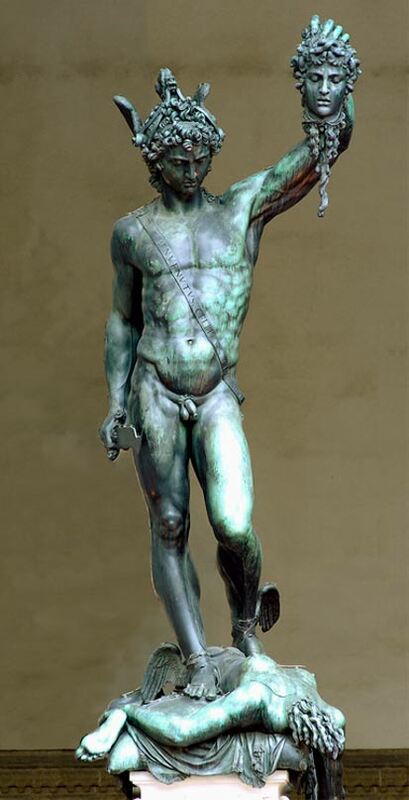 Perseus, presented in aesthetic perfection, uses his resourcefulness, athleticism, and godly gifts to slay the evil monster Medusa. Superman’s physical powers and his urge to protect humanity enable him to defeat evil that humans cannot beat (and sometimes cause). The familiar character of Hercules is comparable on some levels to the modern vigilante super hero Batman. In both myths, the hero comes from tragic beginnings: Hercules was driven to kill his wife and children in a fit of madness caused by Greek deity Hera. Guilt-ridden, he undertook twelve labors to redeem himself, and acted heroically in the process. In a similar vein, Batman witnessed the murder of his parents as a child, and blamed himself for the tragedy. He vowed to wipe out criminality in the city of Gotham, seeking redemption in the process. In a comparison of ancient and modern “reluctant heroes”, both comic character Spider-Man and influential Greek champion Odysseus can be examined. Odysseus had no wish to join the Trojan War, leaving his young son behind. He found eventually that he had to go, not due to a need to act as a hero, but because he was pressed to fulfill a greater good. Similarly, Spider-Man did not wish to defeat evil or stop crime until his uncle was murdered. This need to right wrongs spurred both characters to action, and heroic deeds. Their personal desires were left behind and they became “super”. Some so-called modern super heroes are linked directly with ancient mythology. Certainly the image of ancient Nordic deity Thor is found today in movies and in popular culture as belonging to a league of modern super heroes. In addition, Wonder Woman (whose secret identity is Diana) dealt with war, injustice, conflict and death involving the Olympian gods. She was possessed of the strength of Demeter, and the wisdom of Athena. She was given a lasso forged by Hephaestus to discern truth, and the sandals of Hermes to move with immense speed. Thor’s and Wonder Woman’s magical, super-human qualities, relationships to the gods, and mighty weapons are not out of step with our contemporary understanding of mythical heroism. Truly, the ancient legends and myths never died. They remain embedded in the fabric of our cultures, and whether we refer to them as Superman or Heru, the super-human qualities they possess are still traits we aspire to attain. Featured image: Superman, Wikipedia/ Fair Use . Horus, an ancient Egyptian falcon headed-deity, Wikimedia Commons. Deriv. The long awaited and widely anticipated Messiah, whether he is to come or to come again, is a very ancient and ubiquitous archetypal figure. He is, no doubt, the framework upon which many of these man/god personations are built. Consequently they all resemble each other to some degree (some much more than others), in their common attempts to fulfill the same set of messianic prophecies. Usually this manifests itself in an effort to denigrate Jesus as a "copy-cat" of Horus, or Dionysus, or Apollo (Heracles or Perseus) or take-your-pick; but the messianic concept is an ancient one and it is the true target of this widespread imitation. It is kind of refreshing to see this argument diluted so much (and really exposing the absurdity of it) by extending it to modern comic book characters in the present article. I’m sure if you compared just about any two mythical figures you would find many similarities. Joseph Campbell goes into great length on this subject. Most mythology uses common themes and stories. Its quite fascinating to study these similarities as they are tied to the human psche. I highly reccomend The Hero with a Thousand Faces by Joseph Campbell for a detailed look at the commonalities found in mythologies from around the world.